Katrine Goldstein, managing director of Copenhagen-based Norm Architects, offers her take on the enduring appeal of Scandinavian design. The continued rise of Scandinavian design has shone the spotlight not only on iconic Mid-Century furniture, but also on up-and-coming studios that form the contemporary apotheosis of the Nordic trend. 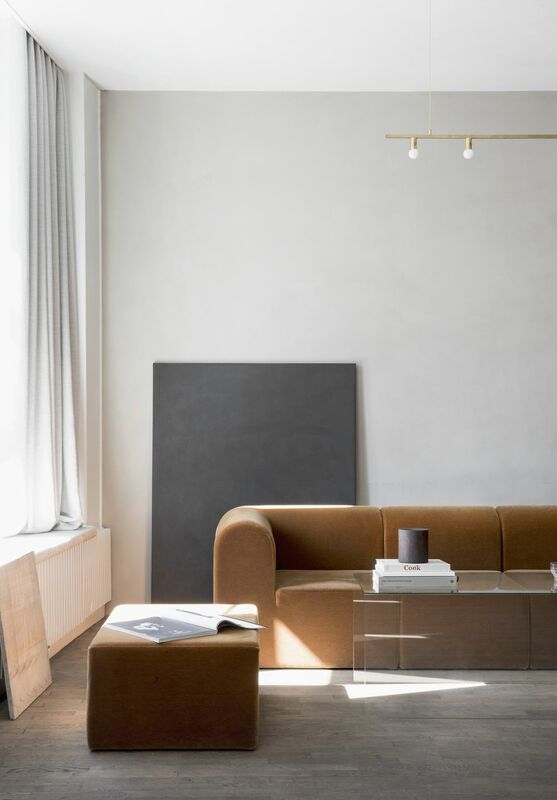 If you love the elegant minimalism of Scandinavian style, Norm Architects is one impressive studio to follow—its inviting, elegant and harmoniously tactile environments are conveyed through a canny use of tones and textures. Founded in 2008 by Jonas Bjerre-Poulsen and Kasper Ronn, the practice has worked across fields as varied as product design, home interiors, and art direction and photography for furniture brands such as Menu. Norm’s thoughtful approach to design marries form and function beautifully— for instance, consider its sound-absorbing cabinets for Swedish brand Zilenzio, which were designed to improve the acoustics of any space while remaining a pleasing sight for the eyes. Norm’s most recent projects include the multifunctional interiors crafted for Menu Space and Kinfolk Gallery in Copenhagen. With its dynamic and growing team, the studio seeks to expand its scope of work even further. Hospitality projects could be its next target—a perfect chance to combine the team’s holistic approach to design within a single project. “We have always dreamed of doing a boutique hotel, where all of the competencies within our team can be used to elevate the project holistically,” says Katrine Goldstein, as we chat in the lovely Old Town neighbourhood of Copenhagen, where the team is based. Here, she explains the studio’s design approach and the continuing appeal of Scandinavian style. Your studio has a very diverse portfolio. How do you manage these myriad projects all at once? Katrine Goldstein (KG) We always strive to be versatile and holistic in the way we work and approach new projects. By combining multiple creative disciplines such as architecture, design, photography and art direction in our daily practice, our projects often end up much stronger and richer—both conceptually and aesthetically—than if we were to stick to one area of expertise. On the other hand, it also requires a certain amount of flexibility in the way we organise our work, as projects tend to stretch over long periods of time and can change in scale, budget and ambition quickly. KG At the moment, we are working on several projects in architecture, design and art direction. This includes new furniture designs, retail concepts, private residences, art direction and photography for companies, and an art exhibition. Scandinavian design has been growing in popularity. Why do you think people love Nordic style so much? KG Scandinavian design has been well regarded since the 1960s for its simplicity, and its focus on functionality and craftsmanship. We believe that these values will always define Scandinavian design, and that it will survive the coming and going of various trends. Nordic style also comes with a lifestyle many people aspire to—it’s democratic, free and honest. Scandinavians are privileged to live in cities where it is affordable to buy comfortable and beautiful design through local products—it’s why many people around the world want a bit of that atmosphere. Where do you go to seek design inspiration? KG As designers, we seek inspiration from all over the world. At the moment, we find it very interesting to combine our minimalistic design language with materials in deeper and warmer colours that you would find in countries such as Brazil. We are also great fans of Japanese architecture and aesthetics, and Atelier Bow-Wow is among the studios we truly admire. This article was adapted from Singapore Tatler Homes October-November 2017.